It may lack the grace and sleekness of a Spitfire or a Mustang, but the Harvard makes up for this in its rugged good looks and sheer volume and has won a place in many hearts, particularly in South Africa. So what is it like to have a flight in one? I was lucky enough to get an opportunity with The Harvard Club of South Africa. 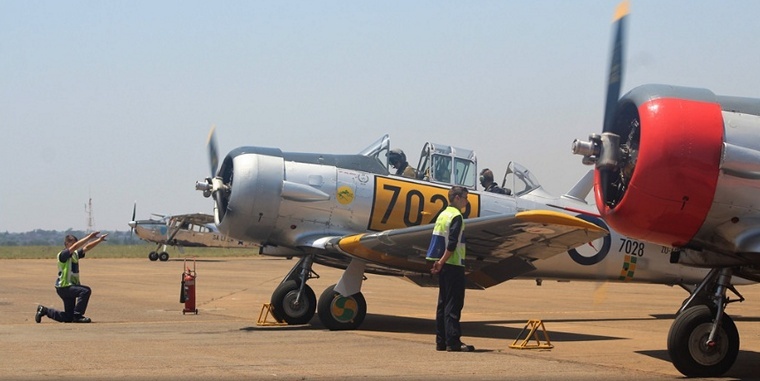 At the recent Gaborone International Airshow, Flying Lion's pilot Arnie Meneghelli claimed that the Harvard was the most famous plane ever built. 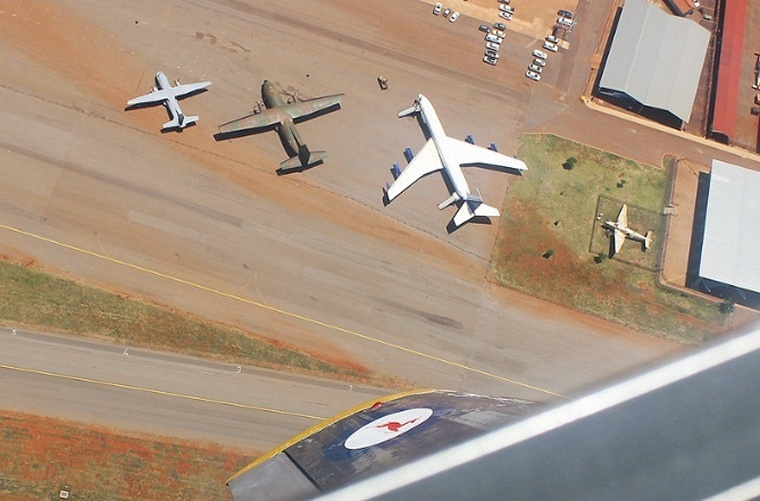 This might be a slight exaggeration, but the number of these warbirds still in the air is a testimony to its excellent design and owes a lot to the South African Air Force. 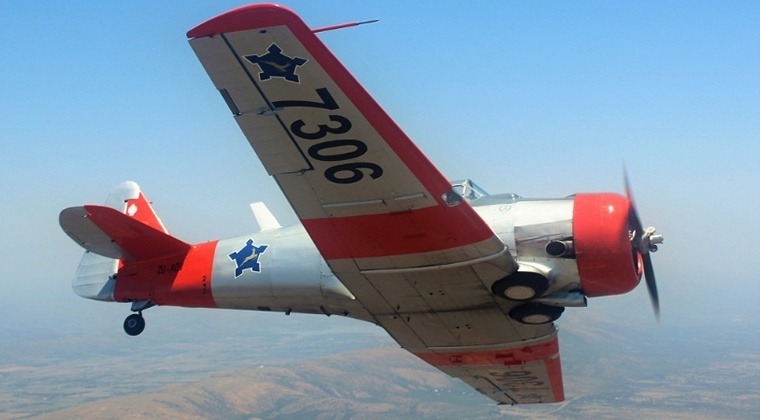 The fact that the public can have aerobatic flights in one is largely down to the hard work of The Harvard Club of South Africa and its volunteers. After a putting on a one-size-fits-all flight suit and a briefing in the Harvard Club's lecture room it is time to make the acquaintance of Harvard 7028. 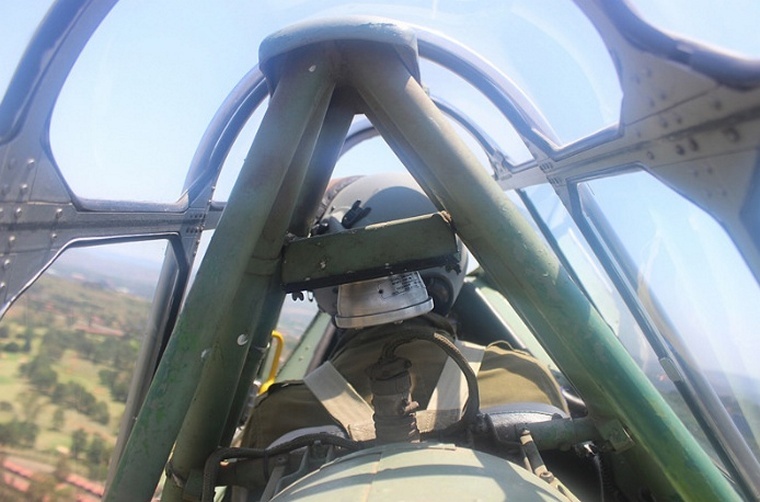 My pilot, Grant Timms, was quick to put me at ease and was a fount of knowledge - as might be expected of a Mango employee who flies warbirds as a weekend hobby. A development of the North American of the NA-16 which first flew in 1935, the AT-6 Texan (the original American designation) is a serious piece of metal weighing in at 2,500kg at take-off and powered by a 600hp Pratt and Whitney Wasp. Approaching a T-6 for the first time is an intimidating experience for someone more used to flying a Bantam microlight. However, this must be a feeling that trainee pilots have had since the Texan entered American service in 1938. The initial order of 180 for the USAAC was dwarfed by that of the RAF, which was undergoing a rapid build-up as World War II grew forebodingly on the horizon. It was the RAF that gave the name 'Harvard' to the aircraft, continuing the tradition of applying education linked designations to its trainers. Climbing into the cockpit is a fairly straight forward experience - left leg on wing, right leg on foot support, then onto the seat, and slide into place. It is certainly easier if you are not on the shorter side. The cockpit is a surprising distance from the ground and it comfortable and spacious, something that seems to have been a feature of American types of the time, especially when compared to British designs. It offers excellent all-round views, despite the framing of the canopy, except to the front where the view is nearly none-existent due to a structural roll over bar and the front pilot's head. It would take a lot of confidence in your pupil to instruct from here! The aircraft I am in is Harvard 7028. It was part of a 1941 order for the RAF and owed its existence to the desperate need by the British for trained pilots. Although most of the initial purchase made their way to the UK (being topped up by a diverted French order), thousands more supplied under the terms of the Lend-Lease act found themselves either in Canada, Rhodesia or, as in the case of 7028, to South Africa under the ever expanding Commonwealth Air Training Plan. These countries offered safe skies to train the constant stream of aircrew the allies required. Interestingly, Australia used a home built development of the NA-16 known as the Wirraway which was externally similar to the Harvard but had a three bladed propeller attached to a reduction gear - this slower turning unit meant that the Wirraway never produced the Harvard 'growl' (or inflicted the 'Harvard Ear'!) as its propeller tips never approached the speed the way that its nosier American cousins did. Although 7028 was ordered under an RAF contract and received an RAF serial, it was transferred immediately upon delivery to the SAAF. I am lucky that the day I am flying is a busy one, so we will make transition to the aerobatic area as a two-ship, with Harvard 7306 keeping us company. Taxiing to the hold we are made to wait a short while as another Harvard makes its approach. The take-off is a formation one and we are in the lead with 7306 just behind our starboard wing and we are soon on our way to Rosslyn, situated in-between Wonderboom Airport and Hartbeespoort Dam. The Harvard Club give you the choice of a scenic flight or an aerobatic one and I have chosen the latter. As we head just east of north and away from the conurbation that is Pretoria/Johannesburg the landscape turns into something that would have been familiar to the tens of thousands of airmen from all over the Commonwealth that trained in Southern Africa before being posted to combat units, usually either in the Middle-East or Europe. Having undergone initial training mainly on Tiger Moths it was the cream, those thought capable of managing single seat fighters, that went on to the Harvard. Those aiming for less glamorous multi-engine duties would be sent to units operating types like the Airspeed Oxford. We start with a wing-over before moving on to a loop and a couple of rolls. It becomes obvious why the Harvard was ideal in its role. Perhaps not the easiest aircraft to fly, the Harvard is fully aerobatic and capable of a spirited display in the hands of a competent pilot. It certainly offered a perfect bridge between the ab initio types and the front line types of the day. However, it is also clear what a step up it is from the everyday flying that most of us experience in the general aviation community. Despite knowing what to expect, the quickness of the movement, especially in the rolling axis came as a surprise as did the experience of a couple of seconds of sustained G in the loop. Apparently, it was only 2.5g but it felt a lot more! A couple of seconds of level flight followed, while Grant checked his passenger was still conscious and not needing to use paper facilities stowed just next to your right elbow, and then the sequence was repeated. 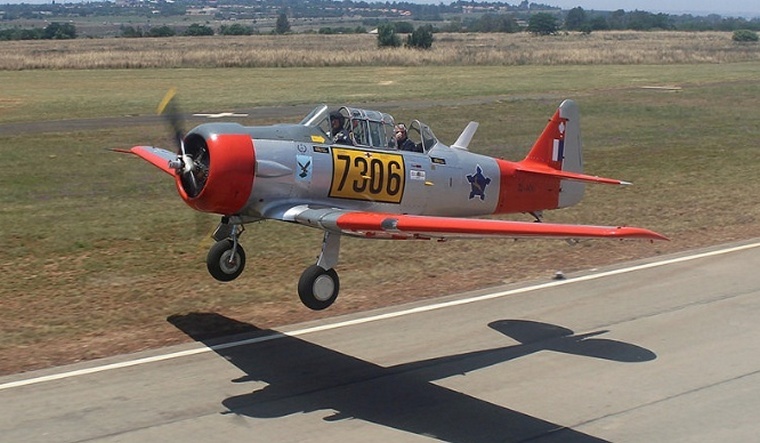 Heading back to Zwartkop AFB gives me some time to think about why the Harvard became such a legend in South Africa. The South African Air Force definitely made full use of its Harvard fleet after WWII was over even with the introduction of the first jets to its armoury, the initial Vampires arriving in the early 50's. Few back then could have seen that the SAAF Harvards would go on to train three generations of pilots. The explanation for this partly lay in the sturdiness and reliability of the Harvard airframe and partly it was due to increasing embargoes on military hardware that meant the apartheid regime found it very difficult to source an adequate replacement. Politics aside, the SAAF maintained its reputation for effectiveness and professionalism throughout those years and this was in no little part due to the effectiveness of the Harvard in teaching new pilots not only the required skills but the need to have respect for their mounts. My reverie is interrupted as 7036 slides across the top of my canopy and takes the lead to our right. It is clear that Grant has a lot of confidence in both his aircraft and his fellow pilot and we ease effortlessly into position with our wingtips only a handful of metres apart for the journey back to the circuit. A proper fighter break at the end of the runway and we are soon settling down on finals. Back on the ground we do the 'Top Gun' walk down the flight-line and then have time for a group photo before it is back to the clubhouse to receive our Harvard Club of South Africa membership certificates, valid for a year. It also gives a chance to look around the clubhouse and find out more about the Harvard Club itself. 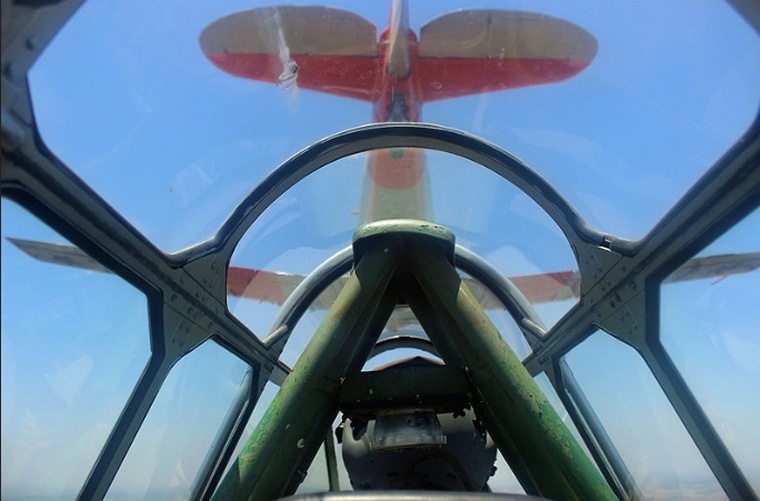 It owes it origins to a group of SAAF Harvard pilots who got together in the run up to the 50th Anniversary of the Harvard's SAAF service in 1990, which saw a memorable - and noisy - formation of 50 Harvards. The following year it was announced that the long serving trainers would be replaced by the much more modern and capable Pilatus PC-7s. Amid concern that the Harvard fleet would all be sold to overseas collectors a plan was put together to have 10 designated as national monuments to allow future generations the experience of having a flight in one of these magnificent machines. By the mid 1990's the Harvard Club was flying its machines out of Springs Airfield before the idea was floated to make the SAAF Museum a sort of 'Duxford' with the Harvard Club forming a valuable addition to the pull already exerted by the museum's fleet. This came to fruition in 2000 and the move has proved a big success. The funding for the Harvard Club comes from various sponsors but it relies on the constant dedication, hard work and fund-raising efforts of its members and volunteers. I cannot recommend enough that anybody who has any interest in either flying or history makes a flight in one these national monuments. Currently the price is R2900 for a 20 minute flight, and unlike some operators this is twenty minutes air time - not from start up to switch off. The Harvard Club are extremely professional, helpful and friendly, and provide great facilities for family members who want to come and watch. 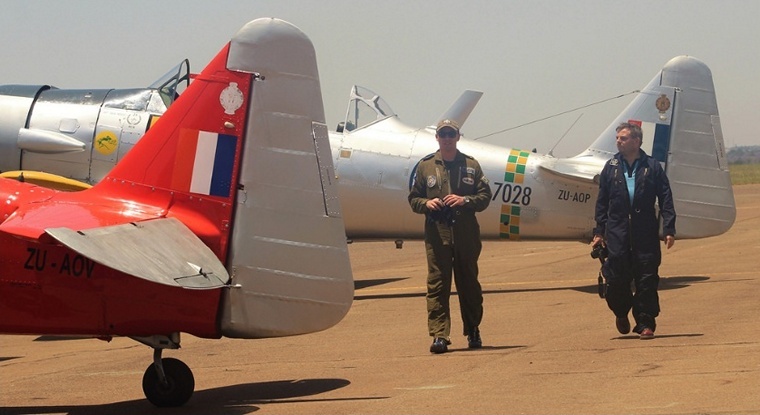 In addition, the fact that they are based at the historic airbase at Zwartkop, the home of the SAAF Museum, makes the whole day even more special. For those interested in piloting a Harvard they do type conversions and formation training as well.